I’m not gonna lie, I like big phones. Before I became a full-time Android phone reviewer, I divided my time equally between the Nexus 6P and the iPhone 7 Plus, and I was more than a little bummed that I never got a chance to try out the Galaxy Note7. But the HTC U Ultra is just too big. It’s bigger than the Note7 and the Nexus 6P, both of which also have 5.7-inch screens. It’s bigger than the 5.9-inch Huawei Mate 9. It’s even bigger than the rumored dimensions of the Galaxy S8+, which will reportedly sport a 6.2-inch display. And it absolutely dwarfs the LG G6. The U Ultra has a big screen. Two of them, in fact. Even if it wasn’t released in the middle of a race to see which phone has the slimmest bezels, the U Ultra would still be the largest phablet on the block. But I never felt like its size was offering any kind of a tangible benefit. After my first few hours with it, I wrote down a question on my notepad: Why is this phone so big? And over a week later, I still haven’t come up with a good answer. When you take the U Ultra out of the box, you’ll notice something strange: A case is included. Lots of companies make cases for their phones but I can’t remember the last time one came with a phone, as if it was a necessary accessory like a charger or a set of earbuds. The back of the U Ultra is as slippery as it is stunning. And as you’ll quickly realize, it kind of is. 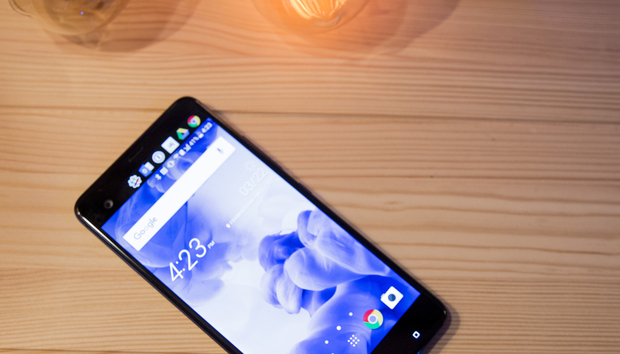 The U Ultra’s size isn’t a bad thing in and of itself, but HTC compounded its bigness by making it so darn slippery. It’s already hard to hold, but its decision to adopt a “sophisticated liquid surface” is all the more puzzling. And even though the bundled case makes the phone even bigger, it does help keep from slipping out of your hands. But the cheap, clear case definitely detracts from what is definitely one of the most beautiful phone backs ever made. Its in the same league as the Jet Black iPhone 7, but where Apple made its surface a little tacky to help with handling, HTC’s is so smooth you’re pretty much guaranteed to drop it. Granted, HTC will send you a free replacement the first time the screen breaks (thanks to a bundled year of its Uh Oh protection plan), but if you’re buying a $750 phone, you’re still going to worry about it. There’s no denying that the U Ultra is a gorgeous phone, but some of the design decisions HTC made here are a little odd. It doesn’t have a dual camera, but it does have a camera bump, and a pretty aggressive one at that. And that mirrored glass back that looks so gorgeous in renderings is an absolute magnet for fingerprints, so much so that it comes bundled its own cleaning cloth. As a colleague noted, if you at this thing wrong it smudges. Fingerprints and smudges are a fact of life with the U Ultra. There’s also a weird little hump at the bottom where the USB-C port is, which I’ve never seen on a phone before. It’s not like the U Ultra is incredibly thin or anything (at a shade under 8mm, it’s around the same thickness as the Galaxy S7), so I don’t understand why HTC couldn’t make enough room for a USB-C port without this bump. The USB-C port has a weird little hump around it. There’s also a series of holes all around the case, five in all: One on the front, one on the back, two on the top, and one on the bottom. One of them is the eject button for the SIM tray, which is strangely positioned along the top edge of the phone, and the other four are “high-sensitivity omnidirectional” microphones for 3D audio recording, but most people are just going to notice that they’re there. Honestly, I couldn’t tell you where the microphones are on any of my other phones (including the Mate 9, which also utilizes a quad setup), but on the U Ultra, I’m very aware of them. The rear of the U Ultra might be marketed as “liquid,” but the phone itself needs to stay away from it. It’s not waterproof, and by the end of the year, there’s a good chance it’ll be the only flagship that isn’t. The Pixel was probably the last premium phone that could slide by without an IP67 or 68 rating, as evidenced by the recently launched G6, which shed its longstanding removable battery for the sake of water resistance. There’s a lot of room below the screen, so why did HTC make the capacitive buttons so small? On the front of the U Ultra you’ll find a 5.7-inch Quad HD 2560 x 1440 LCD display at 513 ppi. There’s not much to complain about here. It’s vibrant and crisp, and a excellent set of customization options let you set the color to your liking. The bezels don’t do the size of the phone any favors, and the pill-shaped fingerprint sensor isn’t quite centered in the bountiful open space below the screen, making it even more awkward to hold than it needs to be. However, even though I often missed the sweet spot, it was still fast and accurate, and I kind of liked having a home button on the front after so many manufacturers have moved it to the back. That’s no hill, that’s a camera bump. The power button is below the volume keys, but a rugged texture helps limit the fumbling. The usual pair of capacitive navigation buttons flank the home button, but they’re way too small and also positioned much too low. I had to resort to keeping them illuminated so I knew where to press. If HTC had centered the fingerprint sensor and doubled the size of the navigation buttons it would have made the phone much easier to operate, and given its size it could use all the help it can get. Where the front of the U Ultra really goes astray, however, is with its so-called secondary display, a gimmick we’ve already seen on the LG V20. While it seems like a good idea in theory (kind of like the Macbook Pro’s Touch Bar), the two-inch screen is too cramped to be of much use (kind of like the MacBook Pro’s Touch Bar). The U Ultra’s second screen actually comes in handy at times. It doesn’t quite reach all the way across the screen, and it doesn’t quite blend into the blackness next to it. But when it’s on it’s looks good. You can have up to six different screens on the secondary display, choosing from an upcoming event, a reminder, six contacts, music controls, weather, and six app shortcuts. Notifications also show in the little screen, but that doesn’t stop them from appearing as banners in the notification shade as well, which can get annoying, especially since there’s no way to stop them from appearing in the tiny screen. When the main display is off, the secondary screen can be activated by double tapping, and it gains a set of quick settings that lets you toggle things like Bluetooth, Wi-Fi, and the flashlight. While it’s useful here, I can’t understand why it isn’t an option on the main screen. Equally annoying is the clock that appears when the screen is off. Not only is it superfluous to look at a the tiny screen when the massive one below it also shows the time, but there’s no way to change it from military time. And for whatever reason you can only see the weather forecast (which is also based on a 24-hour clock) when the screen is off. With such a enormous body, you’d think the U Ultra at least has a giant battery to power you through a couple days of use. You’d be wrong. HTC has put a 3000 mAh battery inside its latest flagship, which, like the rest of the phone, might have been impressive 12 months ago. Simply put, size matters. With bigger screens and faster processors, batteries have to work harder than ever, and 3,000 mAh is the absolute bare minimum for a phone of this size, with the latest phablets all besting the U Ultra: the Pixel XL (3,450 mAh), Mate 9 (4,000 mAh), LG G6 (3,300 mAh), and even the mid-tier OnePlus 3T (3,400 mAh). And there’s no HTC optimization behind the scenes here to squeeze extra juice out if it either. It lasts about as long as you’d expect, 6 or so hours of heavy use, which will be enough to make it through some days but woefully inadequate on most of them. Despite its huge size, the U Ultra only has a 3,000 mAh battery. In our benchmark testing, it barely held its own against the 18-month-old Nexus 6p, and the newer flagships easily bested its 5-hour-and-change running time, with the Mate 9 nearly lapping it. It’s probably the most disappointing aspect of the U Ultra, and as you can tell, that’s saying something. One area the U Ultra excels, however, is sound. Where most manufacturers overlook audio as a defining feature, HTC has always placed a premium on it, proudly showcasing its speaker grilles on the One, and partnering with Beats years before Apple forked over billions to buy it. The U Ultra sports HTC’s patented BoomSound speakers, which sound pretty incredible, as do the bundled pair of USonic earbuds. The U Ultra scans your ears to get optimal sound out of its bundled U Sonic earbuds. But they don’t connect to the U Ultra using the standard 3.5mm port. HTC has dumped the headphone jack in the interest of higher fidelity, so it’s USB-C or a third-party dongle (and given the preponderance of U branding here, I’m legit shocked, HTC didn’t rename it USB-U). But while USB-C gives the U Ultra’s earbud’s some unique audio capabilities (like personalized listening modes), it’s ultimately a bad decision, especially since the phone doesn’t have wireless charging, despite its all-glass back. Apple might be able to get away with it, but HTC can’t afford to turn buyers away for what is essentially an arbitrary reason. There’s no reason why HTC couldn’t have touted the benefits of USB-C audio, kept the legacy jack and included wireless charging, all without making the case any bigger than it already is. The U Ultra is one of the last flagships to utilize Snapdragon’s soon-to-be outdated 821 chip, but it’s currently still top of the heap and more than capable of handling a heavy workload. Besides, it’s looking like the Galaxy S8 will be the only phone to get a supply of 835s until at least the summer, so it’s hard to find fault with HTC’s decision. Performance-wise, it’s as you’d expect from an 821-powered phone with 4GB of RAM, multitasking with ease and handling whatever comes its way. The 821 has been around long enough where it doesn’t blow anyone away anymore, but it’s still an extremely impressive chip that keeps games and apps humming all day long. At no point during my time with it did the U Ultra feel slow or sluggish, and from what I’ve seen with the Pixel, that same should be true after six months. The U Ultra performs as you'd expect a Snapdragon 821-powered phone to. While the Galaxy S8 will surely best the U Ultra and other 821 phones once it gets benchmarked in a few weeks, I suspect most users won’t see a major performance difference between the two chips. When HTC released the 10 last year, it brought a new rear Utrapixel camera setup that produced stellar results: a 12-megapixel sensor with 1.5 micron pixels, with a super wide f/1.8 lens, laser autofocus, optical image stabilization, and two-tone LED flash. Since that phone landed, however, the Pixel has taken photography to another level. Both images are fine, but the one on the right from the Pixel has more accurate colors and detail. So you’d think the U Ultra would have some new tricks for 2017, but sadly, the camera inside the phone is the same as last year’s flagship. That’s not to say it’s bad, because it’s not, but there’s nothing new here to get excited about. Panoramas and Zoe mode (for moving pictures) are still represented, but there’s no wide-angle shooting like on the LG G6 or portrait mode like on the Mate 9—really, there’s no new features at all to play with. It’s basically the absolute minimum you’d expect from a phone at this price range. Even without a second camera, the U Ultra (left) handles portrait shots well, but the Pixel is still crisper and more lifelike. But the U Ultra still takes great pics. You get a nice set of manual controls, HDR, and a handy exposure slider when in automatic mode. Despite OIS it can struggle a bit in low light and there was some over saturation with brighter colors (particularly reds), but nothing some light editing couldn’t take correct. I had little trouble quickly capturing crisp, vivid images (though HDR took a noticeable second or so longer to process after snaps), and there’s nothing specific to criticize. It’s just a little boring. Where HTC did upgrade things is with the front camera, giving it a massive 16MP UltraPixel sensor with lots of selfie-inspired features. HTC is hardly the first phone maker to pack the front camera with lots of megapixels, and it makes sense to put some effort into the camera that most people probably use more often then the rear one. The results are quite impressive for a front camera, and whether you’re using it for video calling or Snapchat, your images will be nearly as good as if you were using the rear lens, even in a dark room (where the screen acts as a flash). With so much wrong with the U Ultra, I didn’t expect much from its Sense interface, but I was pleasantly surprised. HTC has built a nice layer on top of Android Nougat that doesn’t alter the stock OS too much but adds some well-intentioned additions. HTC Sense adds some nifty things to Nougat, like the ability to rearrange apps in the drawer and a different sort of assistant. And I’m not just talking about extra settings (of which there are many). I’m talking about subtle little touches that enhance and elevate the experience in intuitive ways. There are badges on the app icons that support them (a feature that’s finally coming in Android O). You can hide apps from appearing in the drawer without uninstalling them. And there’s a handy little Play Store button at the top of the apps list. You’ll get a couple of apps to uninstall and the unsightly BlinkFeed tiles to turn off, but otherwise it’s a pleasure to use. One of U Ultra’s marquee features is the Sense Companion, HTC’s spin on the AI assistant trend. It’s not a Google Assistant copycat, and it’s actually a pretty good idea. Instead of asking questions, HTC’s aide offers suggestions based on how you use the phone, like reminding you to charge up before the battery gets too low or offering new restaurants based on your cuisine choices. I wasn’t able to test its full powers in my short time with it, but it’s a refreshing change from the standard call-and-response virtual assistants (besides, Google Assistant is already available by long-pressing the home button). If you like overpaying, big phones, fingerprint smudges, second-screen gimmicks, and charging multiple times a day, and hate headphone jacks, the U Ultra is your dream phone. But for $750, there just isn’t much to like here. And the coup de grace is the lack of support for Verizon’s network. The HTC U Ultra is only slightly less reflective than a mirror. If you’re absolutely in love with the design, you can check out the 5.2-inch U Play whenever it hits the U.S., but there’s issues there too, with an even smaller battery and a lesser processor, and it’ll still cost you $500. Ultimately the U Ultra is just too expensive, but even if it were a few hundred dollars cheaper, there are just too many bad decisions and cut corners to seriously recommend it. It might be “made for U,” but trust me, you don’t want it.